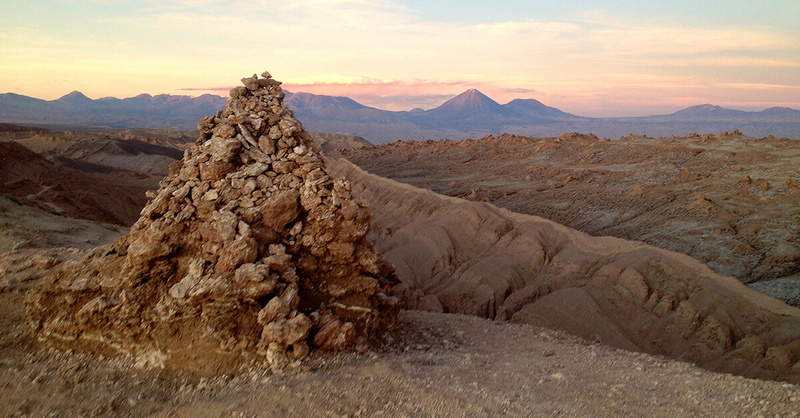 Loving Chile on an Atacama desert tour • Where Is Your Toothbrush? We like to think of ourselves as independent travelers: we eschew agents, tours, hop-on-hop-off buses, and other forms of travel arranged or organized by someone else. 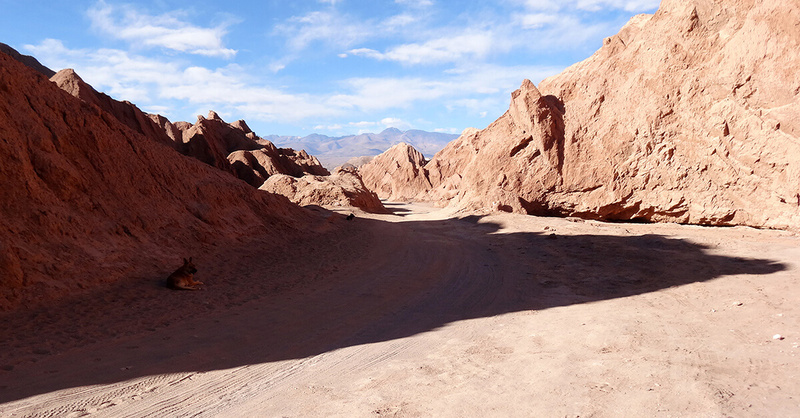 So our hearts sank a bit in San Pedro de Atacama, Chile, when we realized that, to see any nature around the town and keep on budget, we’d have to book a tour. In the end, we went for it because, after all, for us it would be an adventure and many other travelers have done it before us. 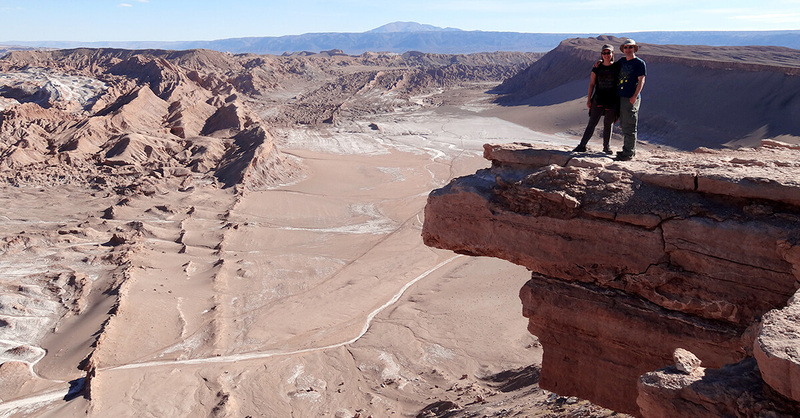 Our Atacama desert tour series turned out better than expected! 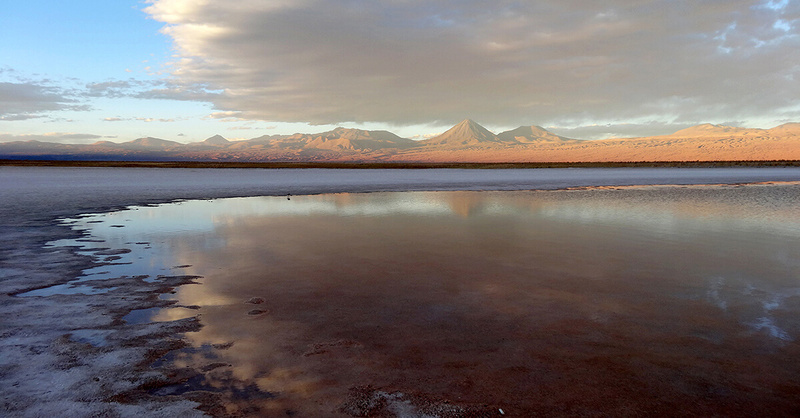 The best deal on tours in SPA is a package of four half-day tours to the most popular destinations: Valle de la Luna, Geysers del Tatio, Lagunas Altiplanicas, and Salar de Atacama. We first visited the agency recommended by our hostel owner to get a baseline, planning to get more quotes for comparison, but since dozens of companies offer essentially identical tours/packages—enough to make a traveler’s head spin—we walked into the nearest agency that looked serious and had no tout outside. The four-tour package at Corvatsch, on the corner of Calle Tocopilla and Gustavo Le Paige, cost CLP55,000 per person (USD100), with transportation, guide, and snacks included. 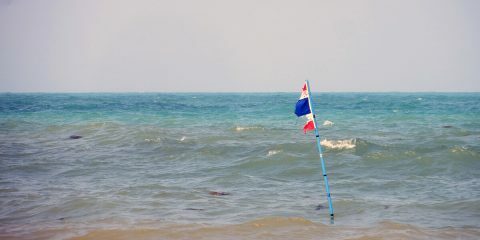 Not included were entry fees to the destinations, which totaled another USD50 for the two of us. Overall we were happy with our lazy choice and would recommend the company. The same goes for taking a tour (or a package of tours) in general. At first the price felt like a hit to our wallets and we hesitated about all the driving around but when we considered the independent option, we concluded a tour is the easier, more economical, and more convenient way to see the sights (just for comparison, a 4×4 rental would have cost some CLP150,000 / 272 for the two days we’d need). 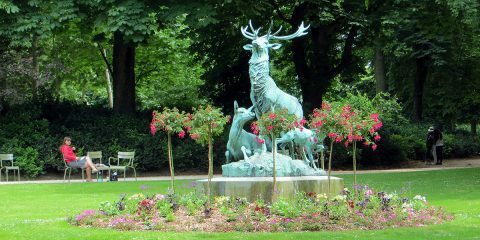 We took the four tours in the package in three days (you can book each individual tour whenever you want). …squeezed through a cavern, and ended the tour by watching the sunset from a giant dune over the Moon Valley. 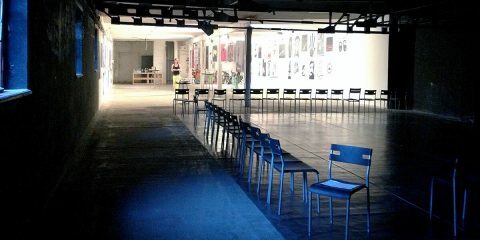 Everything went smoothly. This was reassuring. 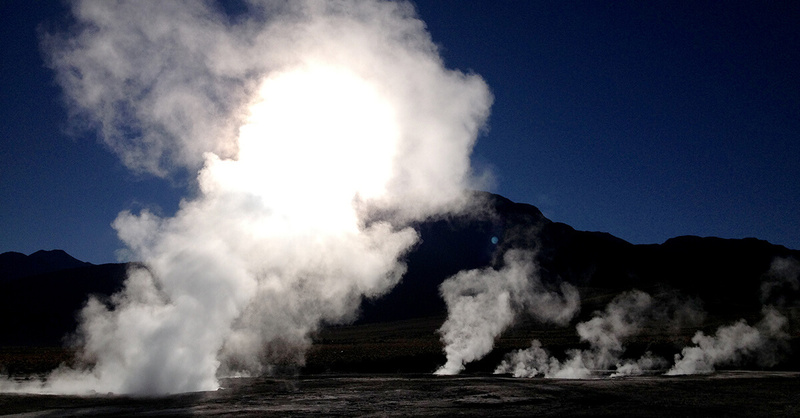 Getting up at 3:30 a.m. for an organized tour never was on our bucket list but for the El Tatio geysers, we had to endure. The minibus picked us up just after 4:00 a.m. and off we were through the cold night to the 4,300 m / 14,000 ft altitude to see the Earth spout steam and gurgle hot water into the freezing temperatures. Coffee and breakfast rarely tasted so good as we strolled between columns of steam, watching the sun rise above the mountain ridge. We both braved a dip in the lukewarm rustic terma (hotspring), heated by the volcanic activity deep below, scalding our fingers when we buried them in the volcanic sand floor. 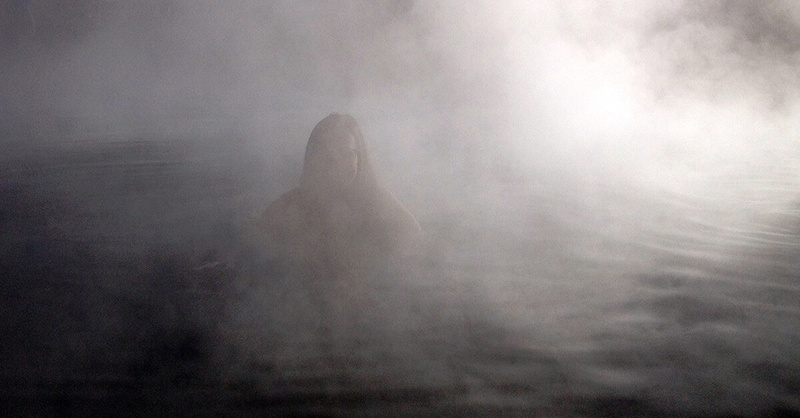 We’d love to have pretended to be superstars engulfed by natural fog machines were it not for the sulfuric stench rising with the planet’s vapors. The tour continued to a tiny village of Machuca, where we admired an old church and good-luck crosses on house roofs and ate fresh empanadas and llama meat on the stick. A final stop to look at giant cardón cacti in a crevasse traversing the valley, and we headed home to rest and prepare for the afternoon tour. 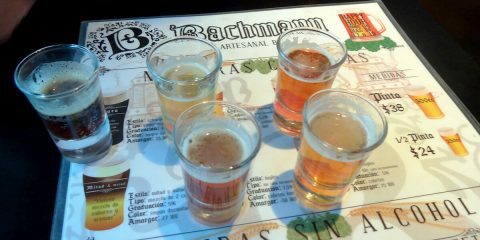 After a nap, we showed up early for the tour of lagunas on the Atacama Salt Flat, the third largest in the world, to be told we’d be going with a different company. When too few customers sign up for a tour, tour companies “sell” their clients to other companies. Having read horror stories about such situations, we settled into a beat-up Mitsubishi minibus of Colque Tours with some trepidation. Alas, everything turned out well, except the guide, nice enough as she was, said little beyond the name of each stop and how much time we had there. 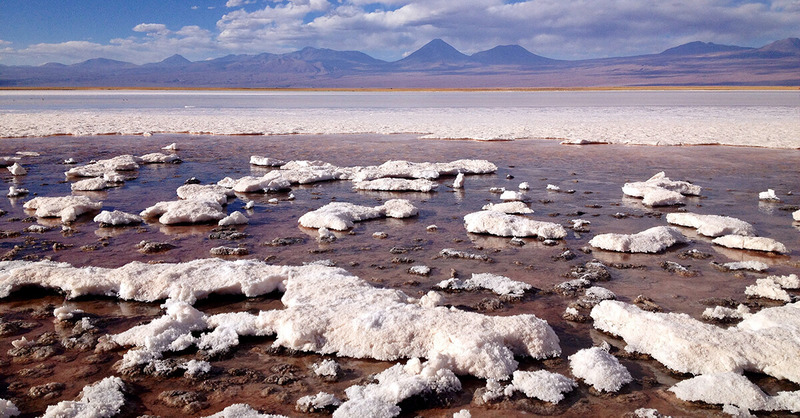 The tour made stops at several lagunas in the northern part of the salt flat. The guide suggested and us customers voted we follow the reverse order of stops to avoid other tours and have the locations to ourselves. 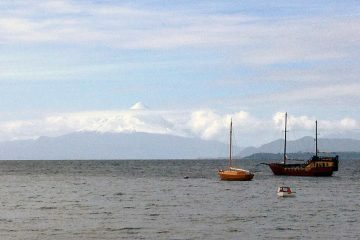 Laguna Tebinquiche is a foot sole-deep lake with clear, salty water covering a brilliant white salt field. We waded around, watching the mountains around us sit tight and tiny fat birds scuttle. 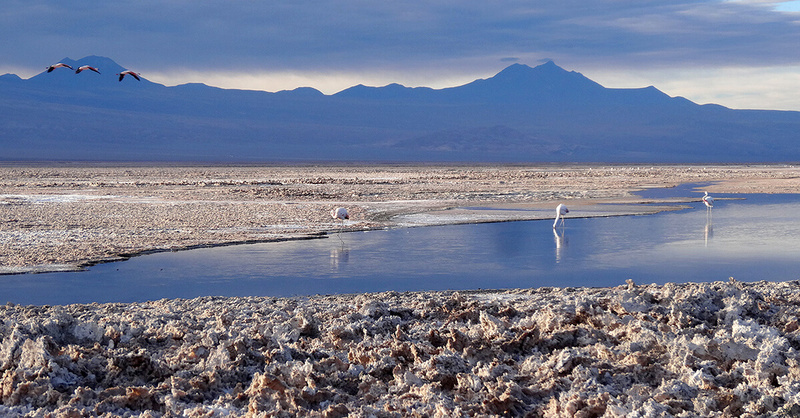 Ojos del Salar are two water-filled holes in the dusty part of the salt flat. We watched a few bros jump into one, circled them both, and were ready for the final stop. 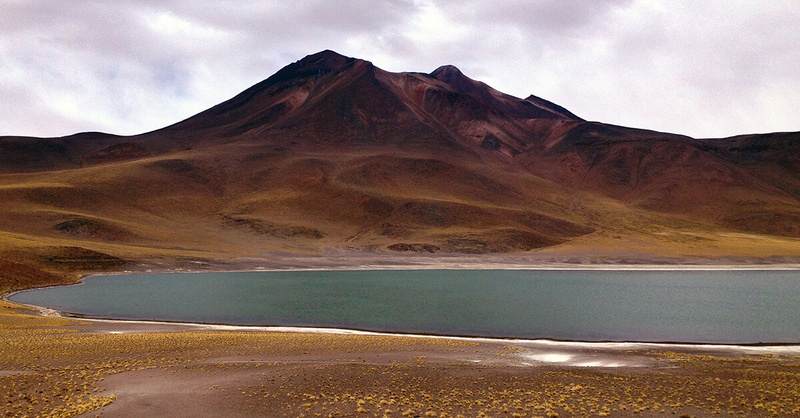 We skipped swimming in Laguna Cejar because it got a little chilly as the sun began to set. 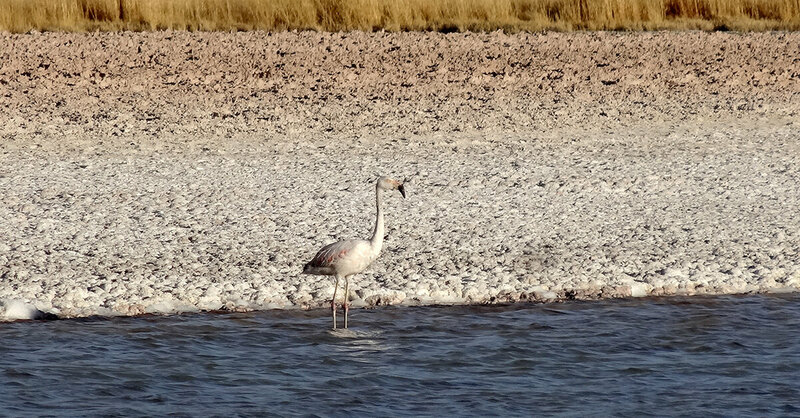 We walked around a nearby little lagunita and saw our our first flamingo in the process, and one with a sad at that. Then it was off to the main lake, where pisco sours, potato chips, and peanuts awaited while the setting sun tinted everything red. 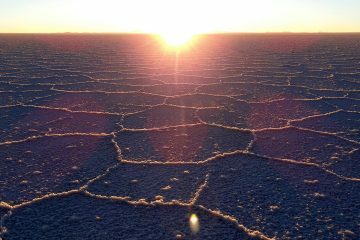 The final tour, to high-plateau lakes, required another early start, albeit at 6:00 a.m. We were reacquainted with Iván, who now spoke English, too, because the majority of the tour group were foreigners. 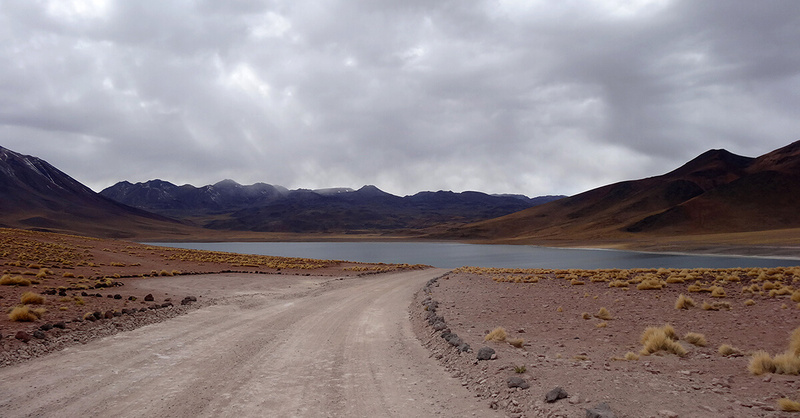 We watched the sun rise over the Andes as the van barreled down paved and dirt roads toward Laguna Chaxa, part of the Los Flamencos National Reserve. And flamingos is what we got. 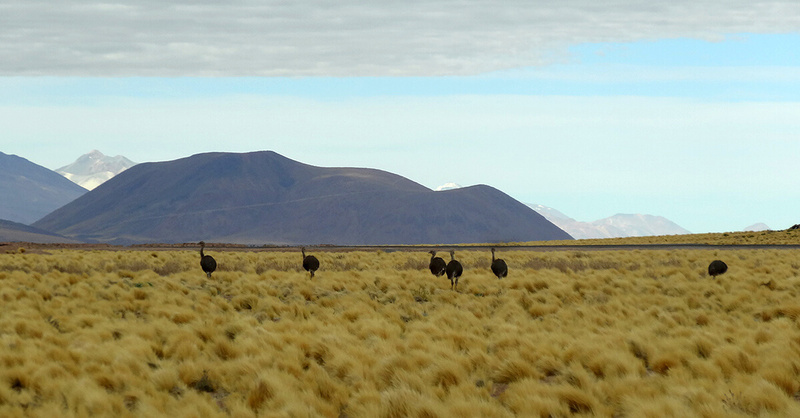 The day got longer as we headed up and up into the hills, spotting vicuñas and a family of ostriches, sans mom (Iván joked, translating a Chilean-Spanish phrase, she was off working the oldest profession). Thus cheered up, we crested a hill and finally saw the first of the two lagunas altiplanicas, Miscanti, at 4,200 m / 13,780 ft. 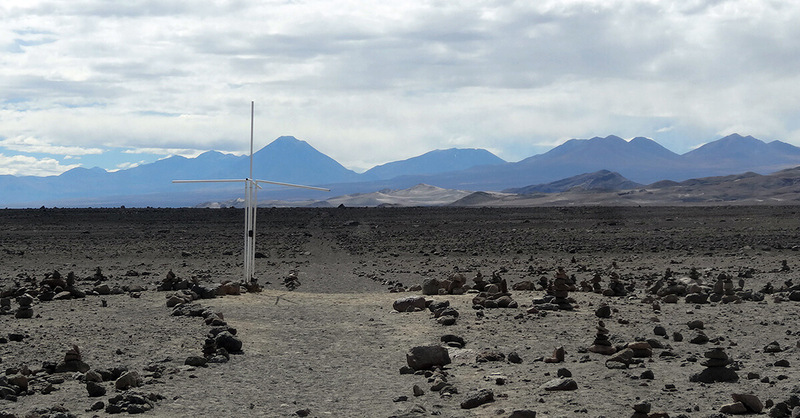 The smaller Laguna Miñique appeared even more remote and hostile as the thin air caught us short of breath, the cold sent us into shivers, and the absence of other tours expanded our spirits into the empty space. On the way back, we made a tired final stop at the Tropic of Capricorn marker. 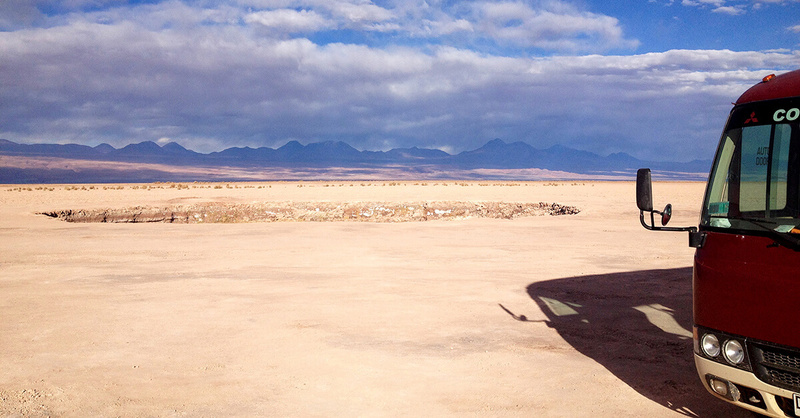 After all that sitting in the van, we were happy to be back in San Pedro de Atacama, a place that had, for better or worse, become our home for five days. 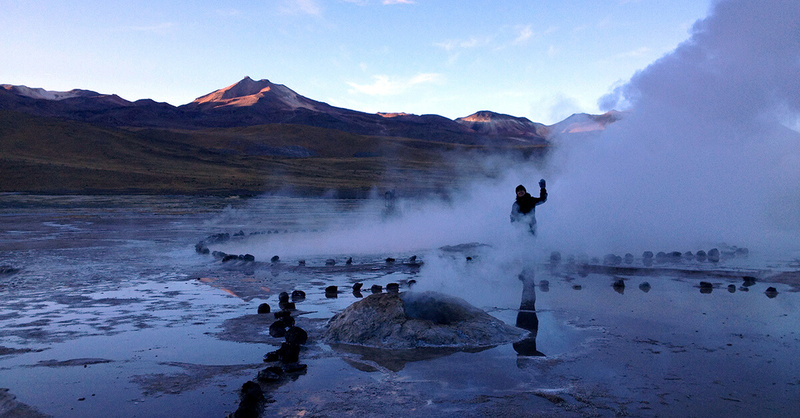 Actually, the El Tatio tour was the best one of the four! You can certainly access the place independently, Stu. A lot of people bike there, which is, of course, faster than walking. I wouldn’t recommend camping, in any case. Parts of this area are in native land or state-owned parks, as you say, so you might be breaking the law camping. There are stray dogs (and likely other nocturnal animals) around and it can get really cold at night. Proceed with caution!